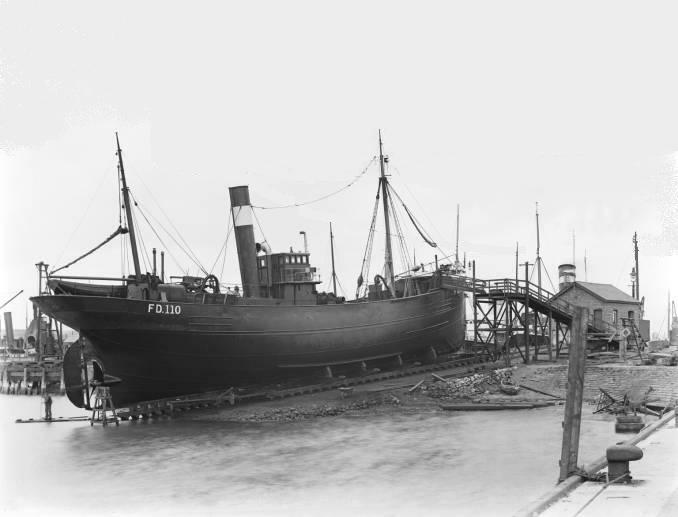 27.2.1907: Launched by Smith’s Dock Co Ltd, North Shields (Yd.No.340) for Richard Watson Mason (sailmaker) & John Wright (fishing master) (64/64 joint owners) Fleetwood as CYGNET. 18.4.1907: Registered at Fleetwood (FD110), John Wright appointed manager. 18.4.1907: Vessel mortgaged (64/64) to London City & Midland Bank Ltd, London (A). 16.5.1907: Sold to Cygnet Steam Fishing Co Ltd, Fleetwood (Richard W. Mason, manager). 17.5.1907: Vessel mortgaged (64/64) to London City & Midland Bank Ltd, London (B). 1.11.1911: Thomas Caldwell appointed manager. 19.4.1911: In collision with sailing trawler KING DAVID (FD93) near ferry slipway. KING DAVID holed and beached on Knott Spit. 8.1914: Requisitioned for war service and fitted out at Devonport as a minesweeper (1-6pdr) (Ad.No.126). 1.1.1914: Tonnage altered to 116.61net under provision of Merchant Shipping Act 1907. 11.11.1914: At Plymouth; Parent ship VIVID. 22.9.1915: Based Plymouth with Unit 122. Later based Stromness. 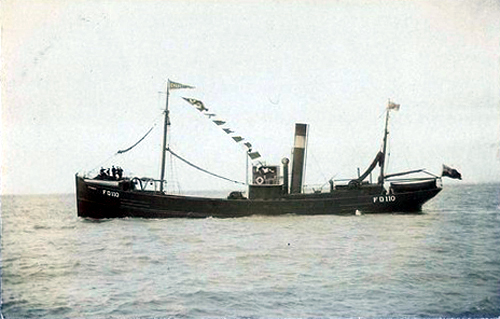 By 12.3.1919: Returned to owner at Fleetwood and reverted to CYGNET (FD110). 1.11.1919: Mortgage (B). Mortgagee changed name to London Joint City & Midland Bank Ltd, London. 11.1925: Sold to Tr°ol AB Fiskm°asen, Uddevalla, Sweden (Sven Sanne, manager). 1925: Registered at Uddevalla as STORMF°OGELN (U18). 1928: Johan Herman Sanne appointed manager. 11.1936: Sold to Knut Vartdal, Aalesund. Registered at Aasund as RAMOEN (M-1-VD). 1936: Transferred to Rederi A/S Ramoen, Aalsund (Knut Vartdal, manager). 9.1939: Transferred to Norwegian Navy as guardship in Oslofjord. 14.4.1940: Seized by Germans and put into service. 1945: Transferred to Rederi A/S Ramoen, Aalsund (Knut Vartdal, manager). 1948: Fitted out as a motor trawler. 1948: Re-engined with 500bhp 2stroke 5-cyl oil engine by Harland & Wolff Ltd, Glasgow. (engine made ?). 1960: Johannes K. Vartdal appointed manager. 1961: Re-engined with 600bhp 2stroke 6-cyl oil engine by Wichmann Mtrf., Rubbestadneset. 4.1964: Reported breaking up completed. 18/05/2012: Page published. 10 updates since then. This entry was posted in Steam Trawlers, Steamers (Picture) and tagged Cygnet SFC, Mason & Wright on May 18, 2012 by Fred Smith.